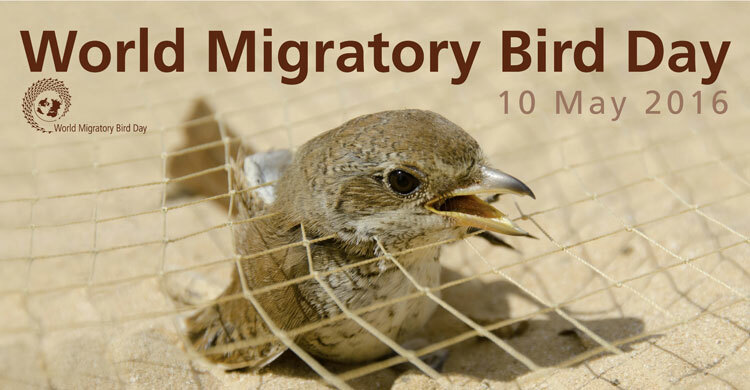 Bonn, 4 May 2016 - Join the celebration of a great natural wonder on World Migratory Bird Day! Take action and celebrate, conserve and raise awareness of migratory birds on or around 10 May 2016 by organizing educational programmes, lectures, bird walks, visits to bird-watching sites, competitions, art exhibitions and other public events. With the slogan “… and when the skies fall silent? ", World Migratory Bird Day 2016 aims to highlight the incredible numbers of migratory birds being lost each year as a result of illegal killing, taking and trade. The motives behind these illicit activities are various and the toll that they are taking is incredible – millions of birds are being killed each year – numbers that are totally unsustainable and which alongside other pressures such as habitat loss and climate change are leading to many once common species being threatened with extinction. Governments around the world have passed both national laws and international treaties to regulate and in some cases prohibit the exploitation of these animals. These laws need to be respected and enforced, or we run the risk of losing a precious resource which is part of our shared natural heritage. On and around 10 May 2016, dedicated organizations, governments and people around the world will plan events to mark World Migratory Bird Day celebrating migratory birds and raising awareness about the need for their conservation. Since World Migratory Bird Day began in 2006, events have been held in 130 countries and this year we hope to reach even more people and organizations through the global campaign. Stop the illegal killing, taking and trade! This year’s campaign is financially supported by the German Federal Ministry for the Environment, Nature Conservation, Building and Nuclear Safety (BMUB), which we acknowledge with great gratitude.